A proposal to redevelop an industrial estate in Alperton and build new homes, new space for businesses and new community facilities is now open for the public to have their say, following the submission of a planning application to redevelop the site. Property firm St George have submitted plans to Brent Council to redevelop Northfields Industrial Estate in Alperton, seeking permission for the existing buildings to be removed and replaced with new workspace, retail premises, restaurants, a community centre, public open space and 2,900 new homes on the twenty-one acre site, located just off the A406 North Circular Road, by the Ace Café. Phase one of the scheme is shown in full detail in the application and would see the Grand Union Canal-side of the site developed first, with new homes and improvements proposed to the public realm along the waterside. The rest of the site extending to Beresford Avenue and the River Brent would be developed in later stages and permission is sought for the principle of this. 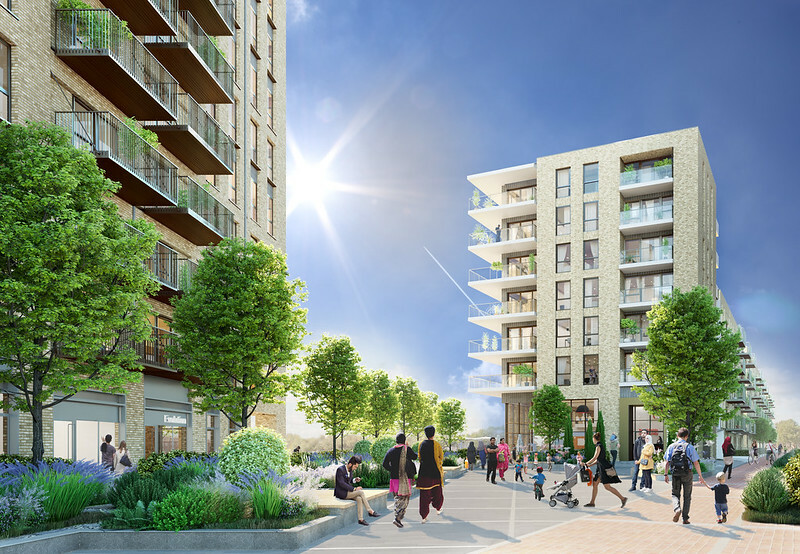 Over 1,250 residents have been written to by Brent Council’s planning department with details of the redevelopment plans which would range between 1 and approximately 29 storeys (88 m) in height, on the brownfield site which is ten minutes from Alperton and five minutes from Stonebridge London underground stations. “This is a very important application which will be closely examined by the council’s planning department before it goes before a public planning committee meeting later in the year for a final decision. The application can be viewed online with computers available at the council’s libraries for those without internet access at home. Further information on how to comment on a planning application is available on the Council’s web site, www.brent.gov.uk/planningcomments. Comments should be made on line via the comments section under application number 18/0321 by 31 March to ensure they can be considered. A decision on the planning application is expected to be made by Brent’s Planning Committee later in the year. in buildings ranging from one to twenty-nine storeys across the site.